"Coming from one of the biggest skeptics and perfectionists around, I can say with utter enthusiasm that Susan has exceeded my expectations in every possible way! I had been penciling the better half of my eyebrows in for as long as I can remember. Being able to wake up and go makeup free, not to mention shedding the anxiety of compulsive checks in the mirror to make sure they’re “still there”, feels almost life-changing. This is the first testimonial I have ever written, which speaks to the enthusiasm I have regarding my experience, but if you’re like me and never trust testimonials, I encourage you to peruse the before-and-after pictures online. Extensive view books are also available during consultations if you need more convincing of Susan’s incredible talent! The patient and kind demeanor Susan exudes put her clients, including first-timers such as myself, at complete ease. I would have paid five times what I did for the excellent results. Thanks, Susan!" I took this picture on Saturday (day 2) to send to my mom and sister. They were surprised (as was I) at how "normal" it looked. No need to hide at home! I was afraid there would be more swelling or scabbing, but honestly it looks fine and is only a little itchy. I am thrilled with the results, and the few people I've told can't believe it's a tattoo, even this early in the process!! I can't wait to see how the next few weeks unfold. I had contacted many permanent make up artists thru out the midwest, obtained pictures of their work and was not pleased with any of them until I found Susan. Her pictures of clients she had done were remarkable. I was a little nervous prior to making the appointment, however after speaking to Susan on the phone and then meeting her, I was no longer nervous as she put me at ease. I found her to be very professional, caring and extremely knowledgeable and TALENTED. I had lost my eyebrows from Alopecia so she had to start from scratch. After having my brows completed, my friends and family could not believe my brows were not real! Every time I look in the mirror, I am just amazed. 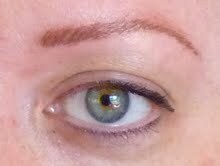 I would recommend Susan to anyone that is considering permanent makeup. She has made my life normal again! Thank you SUSAN!!!! I just wanted to write you a follow-up note. I really love how my eyeliner turned out. Though I hated that needle, I was so impressed with the overall experience. I found you because of your outstanding professional development and credentials - and you were well worth the hour drive from White Bear Lake! I appreciated how thorough and patient you were in your work. It always seemed like you had all the time in the world for me as a person and in perfecting my look. Thank you for being such a caring professional who goes the extra mile. "I did a lot of online research for permanent cosmetics at least two years before I actually made my decision. I was scared to "tattoo" my face because I couldn't erase it if I didn't like it. I'd lost my eyebrows to thyroid disease, so I had to pencil them on every day. It became a chore I hated, and I took a lot of teasing from family and friends. When I finally made my decision, it was because of my research about Susan. She was the perfect choice! She is so professional, with a warmly inviting personality and a clean, comfortable office; she made me feel at ease the moment I met her. She even suggested putting some added color on my eyes with eyeliner, to which she added some color that really enhances my eyes. Her work has made a tremendous impact on my life. I can go out without makeup and that's something I haven't done in years! Friends and family had to get up close and still couldn't believe my eyebrows weren't real. My husband's remarks after I had Susan apply my permanent cosmetics was, "If I'd known what a difference this would make for you, we would have done it years ago." My best friend has now made Susan her choice, too, and loves the results. 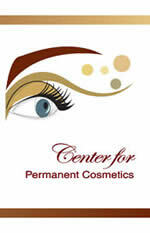 If you're thinking of permanent cosmetics, Susan is your best choice!" "After many months of researching eyelash enhancement and then a resulting consultation with Susan, I decided that she was the person I wanted to use. She answered all of my questions and provided more information than I was aware of. Her knowledge about the permanent cosmetic business, technique, application, color, and her many years of experience (and portfolio) is excellent. The atmosphere in her office is very professional and comfortable. Her demeanor and relaxed personality is such that she instantly put me at ease during the whole procedure. I am extremely happy with my eyelash enhancement and I am recommending my family and friends to her. In fact, my sister and I went in together. I would definitely use her again for any further procedures. Thank you, Susan!" "Susan, I love my brows very much, they are beautiful. My friends ask what's different and people are surprised when I tell them. They are very subtle. " "I love my permanent make-up! I save so much time every day not having to deal with eyeliner and lipstick. I just put on lip-gloss and I'm out the door. I receive compliments all the time on how natural it looks. As you know, I work in a lab where I'm unable to wear make-up, but it's not a problem for me. I recommend your services whenever my permanent make-up comes up in the conversation. I recently was at Scott Lewis School, and one of the estheticians commented on my make-up. She also told me one of the instructors had just had her lips done by you and said they looked great and she loved them! Thanks again for the great job! See you at my next appointment! "